This Property Management Agreement (the “Agreement”) is made and entered into as of this _____ day of ______, 20__, by and between APARTMENT COMPLEX OWNER, a __________ limited liability company (the "OWNER") and APARTMENT COMPLEX MANAGER LLC, a ____________ limited liability company (the "MANAGER"). A. Owner owns the Property (defined below). B. Manager is skilled and experienced in the management, operation, leasing and supervision in properties similar to the Property in the geographic area where the Property is located. C. Owner desires to engage Manager as an independent contractor on the terms and conditions set forth below and Manager desires to accept such engagement. "PROPERTY" - that certain property consisting of the multi-family apartment complex known as ___________ Apartments (sometimes referred to herein as the “COMPLEX”) located in the City of ___________, County of ___________, State of ________ , together with all personal property of Owner attached thereto, located thereon or used in connection therewith. 1.1 RETENTION OF MANAGER. Owner hereby retains Manager to perform the services described below in accordance with the terms and conditions of this Agreement, utilizing trained, experienced personnel and employing professional real estate management practices and techniques. Manager accepts the relationship of trust and confidence established between it and Owner by this Agreement and covenants to use its best skill and prudent business judgment in furthering the interests of Owner. Manager will act in a fiduciary capacity for the benefit of Owner with respect to the proper protection of and accounting for the Property. Manager's duties and responsibilities will commence on the Commencement Date and shall continue until the expiration or earlier termination of this Agreement in accordance with Article 12. "AFFILIATE OF MANAGER" shall mean any person or entity which (i) is a director, officer, partner, member or trustee of Manager, or in which Manager or any Manager Owner is a director, officer, partner, member or trustee, (ii) has any direct or indirect legal or beneficial interest in Manager, or in which Manager or any Manager Owner has any direct or indirect legal or beneficial interest, or (iii) directly or indirectly controls, is controlled by or is under common control with Manager. 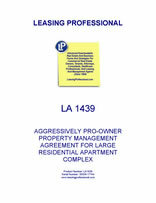 "AGREEMENT" shall mean this Property Management Agreement, which consists of Part I and Part II and such other Parts as may be attached hereto and executed by Owner and Manager, including all Schedules and Exhibits hereto, all as amended from time to time in accordance with the terms hereof. "ANNUAL BUSINESS PLAN" shall mean the annual business plan to be prepared by Manager and approved by Owner in accordance with SECTION 2.9. "APPROVED ANNUAL BUSINESS PLAN" shall mean, at any time, the Annual Business Plan as then approved by Owner in accordance with SECTION 2.9. "BOOKS AND RECORDS" shall have the meaning set forth in SECTION 4.8. "COMPLEX MANAGER" shall have the meaning set forth in SECTION 2.3. "BUSINESS DAY" shall mean every day that is not a Saturday, Sunday or day on which banks in which the Property is located are required by law or executive action to be closed for the transaction of normal banking business. "CHART OF ACCOUNTS" shall mean the form of chart of accounts approved by Owner, a copy of which is included in the Reporting Package, as the same may be modified or replaced as required by Owner from time to time. "COMPETING PROPERTY" shall have the meaning set forth in SECTION 15.1. "CONSTRUCTION BUDGET" shall have the meaning set forth in SECTION 2.8(b)(v). "DAMAGES" shall mean all claims, actions, suits, proceedings, judgments, damages, fines, penalties, losses and expenses, including reasonable attorneys' fees, consultants' and expert witness fees and court costs, including any such costs incurred in any bankruptcy or other legal or administrative proceeding. "EXECUTIVE PERSONNEL" shall have the meaning set forth in SECTION 2.3. "FINAL ACCOUNTING" shall have the meaning set forth in SECTION 12.3. "GAAP" shall mean generally accepted accounting principles consistently applied. "INSURANCE REQUIREMENTS" shall mean all requirements of any insurance policy covering the Property or the use thereof, all requirements of the issuer of any such policy, and all requirements, orders, rules or regulations of the National Board of Fire Underwriters (or similar agencies) applicable to the Property. "INVESTOR" shall have the meaning set forth in that certain Limited Liability Company Agreement of Owner dated as of _______, 200__. "LEGAL REQUIREMENTS" shall mean all federal, state and municipal laws, rules or regulations applicable to the Property or the operation, occupancy, leasing, maintenance and repair thereof. "LICENSES" shall mean all permits, certificates, licenses, approvals, consents and other entitlements required for the operation, occupancy, leasing, maintenance and repair of the Property. "MANAGER" shall have the meaning set forth in the introductory paragraph. "MANAGEMENT FEE" shall mean the product of (x) the Management Fee Percentage times (y) all Rents actually collected for each month during the term of this Agreement. "MANAGEMENT FEE PERCENTAGE" shall have the meaning set forth in Part I. "MANAGER OWNER" shall mean any person or entity that owns, directly or indirectly, 25% or more of the legal or beneficial ownership interests in Manager. "MONTHLY STATEMENT" shall have the meaning set forth in SECTION 4.3. "OPERATING ACCOUNT" shall have the meaning set forth in SECTION 6.1. "OPERATING BUDGET" shall have the meaning set forth in SECTION 2.9(b). "OWNER" shall have the meaning set forth in the introductory paragraph. "OWNER RELATED ENTITIES" shall mean Owner, its direct and indirect legal and beneficial owners, and all officers, directors, trustees, employees, advisors and agents of Owner and all of Owner's direct and indirect legal and beneficial owners. "PROJECT" shall have the meaning set forth in SECTION 2.8(a). "REIMBURSABLE EMPLOYEE EXPENSE SCHEDULE" shall have the meaning set forth in SECTION 2.4. "RENTS" shall have the meaning set forth in SECTION 11.1. "REPORTING PACKAGE" shall mean the sample reports prepared by Manager and attached hereto as EXHIBIT A, as modified or supplemented as required by Owner from time to time in accordance with SECTION 4.2(e). "SERVICE CONTRACTS" shall have the meaning set forth in SECTION 2.10. 2.1 GENERAL RESPONSIBILITIES. Subject to the provisions of this Agreement, Manager shall manage, operate and maintain the Property in a first-class manner and in accordance with the Approved Annual Business Plan. Manager shall perform its duties hereunder: (a) in accordance with the terms of this Agreement; (b) in compliance with all applicable laws, rules and regulations, including the Legal Requirements; and (c) in accordance with the standards and practices of prudent and qualified managers that manage properties similar to the Property on behalf of institutional owners or investors. 2.2 MANAGER'S PERSONNEL; INDEPENDENT CONTRACTOR. (a) Manager shall have in its employ at all times a sufficient number of capable employees to enable it to properly, adequately, safely and economically manage, operate, maintain and account for the Property and otherwise perform its obligations hereunder in accordance with the terms of this Agreement and Approved Annual Business Plan. Owner acknowledges that Manager may employ personnel either directly or through its affiliate, ______________________ ("Manager's Affiliate"), but Manager shall be directly responsible for all employees for all purposes of this Agreement. (b) All matters relating to the employment, supervision, compensation, promotion and discharge of such employees are the responsibility of Manager (with respect to which Manager shall exercise reasonable care); Manager (or Manager's Affiliate, as applicable) is in all respects the employer of such employees. Manager (or Manager's Affiliate, as applicable) shall negotiate with any union lawfully entitled to represent such employees and may execute in its own name, and not as agent for Owner, collective bargaining agreements or labor contracts resulting therefrom. Manager and represents that it and Manager's Affiliate are and will continue to be equal opportunity employers and that they will advertise as such. This Agreement is not one of agency by Manager for Owner, but one with Manager engaged independently in the business of managing properties as an independent contractor. All employment arrangements are therefore solely Manager's responsibility and Owner shall not have any liability with respect thereto. Except as set forth in SECTION 2.4 below, nothing contained herein shall be deemed to permit Manager to charge Owner, or to use the income of the Property to pay, for the services of Manager's employees. (c) Manager and Manager's Affiliate shall fully comply with all applicable laws, rules, regulations and orders relating to worker's compensation, social security, unemployment insurance, wages, hours, working conditions and other matters pertaining to their respective personnel. Manager shall indemnify, defend and hold harmless the Owner Related Entities from and against all Damages arising out of or relating to Manager's failure to comply with this SECTION 2.2. Manager's indemnification obligations under this SECTION 2.2(c) shall survive the termination or expiration of this Agreement. (d) Manager shall be solely responsible for its personnel in the event of the termination of this Agreement. 2.3 EXECUTIVE PERSONNEL; COMPLEX MANAGER. EXHIBIT B sets forth the name of: (a) the senior executive personnel of Manager and/or Manager's Affiliate who will be responsible for the performance of Manager's duties under this Agreement (the "EXECUTIVE PERSONNEL"); and (b) the on-site COMPLEX MANAGER employed by Manager or Manager's Affiliate (the "COMPLEX MANAGER"). Any change in the Executive Personnel or COMPLEX MANAGER shall be subject to Owner's prior approval. 2.4 SCHEDULE OF EMPLOYEES. Attached hereto as EXHIBIT C is a schedule (the "REIMBURSABLE EMPLOYEE EXPENSE SCHEDULE") that sets forth: (a) a list of Manager's or Manager's Affiliate's employees (including the COMPLEX MANAGER) who shall be employed on-site in the direct management and operation of the Property; (b) the respective titles and salary of each such employee; (c) the length of time that each such employee has been employed by Manager or Manager's Affiliate; (d) whether each such employee works full or part-time (and if they work part-time, the number of hours they work per week); (e) the cost of salary and wages that may be charged to the Property for each such employee; and (f) whether each such employee is bonded or covered under Manager's or Manager's Affiliate's comprehensive crime insurance policy. The Reimbursable Employee Expense Schedule shall also identify any employees of Manager or Manager's Affiliate who are not located at the Property but whose salaries may be charged to the Property pro rata based upon services actually rendered by such employees directly to the Property (in which event the Reimbursable Employee Expense Schedule shall set forth the salaries of such offsite employees and the maximum percentage thereof that may be charged to the Property). In no event shall Manager be entitled to charge to the Property any employee-related expenses: (i) that relate to general or supervising management personnel, accountants or auditors; (ii) for which a separate fee is charged by Manager pursuant to this Agreement or otherwise; or (iii) that are not specifically set forth on the approved Reimbursable Employee Expense Schedule. The expenses chargeable to the Property pursuant to the Reimbursable Employee Expense Schedule may be modified from time to time only as part of the Approved Annual Business Plan or as otherwise agreed upon by Owner and Manager in writing. 2.5 COMPLIANCE WITH LAWS, LICENSES, MORTGAGES, ETC. (a) Manager will be responsible (at Owner's expense) for compliance with the Legal Requirements and Insurance Requirements. Manager, with the prior approval of Owner (and at Owner's expense), will promptly remedy any violation of any such requirements, provided that in the case of emergency, or imminent threat to the health, safety or welfare of tenants or any other person, or if so ordered by a governmental authority, Manager shall promptly remedy such violation, provided sufficient funds are available, and notify Owner as soon as practical, and in any event no later than the end of the next Business Day. Manager shall notify Owner and recommend any repairs or changes to the Property or operation thereof which will be required under proposed changes in laws, ordinances and regulations. Notwithstanding the foregoing, Manager shall obtain Owner's prior written approval before engaging any legal counsel or commencing or appearing in any legal proceeding on behalf of Owner. (b) Manager shall, at Owner's expense, obtain and maintain all Licenses. Manager shall provide Owner with copies of all completed initial or renewal License applications for Owner's prior approval and signature, if necessary, not less than thirty (30) days prior to the date such applications are due. All Licenses shall be obtained in Owner's name. (c) Except as otherwise specifically directed by Owner, Manager will be responsible (at Owner's expense) for compliance with all contracts and agreements relating to the Property, including any ground lease, space lease, covenant, condition and restriction, reciprocal easement agreement, and mortgage, deed of trust or other security instruments affecting the Property, provided that Manager has copies of such agreements. (d) Manager shall, at Manager's individual, non-reimbursable expense, maintain its legal existence and good standing and obtain and maintain in effect all licenses and permits necessary or desirable to carry out its duties hereunder. (e) Manager shall, at Owner's expense, make commercially reasonable efforts to ensure that all employees and/or contractors who perform work at or for the Property have all required Licenses and comply with all Legal Requirements. (f) The Manager shall, at Owner's expense, implement and maintain an ongoing environmental auditing program reasonably satisfactory to Owner and any lender to Owner pursuant to which it shall conduct periodic investigations regarding the compliance of activities at the Property with applicable environmental laws, and the existence of and potential for contamination. The results of such environmental audit shall be provided to the Owner. Without limiting the foregoing, Manager shall be responsible for maintaining and ensuring compliance with all operations and maintenance manuals, programs and procedures with respect to all customary environmental issues, including but not limited to, mold, lead paint and asbestos, if any.